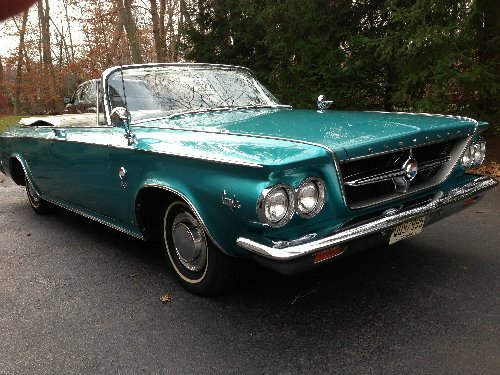 For 1963, Chrysler dropped the convertible letter series version, leaving the new 300 J hardtop (there was no 300 I - perhaps they felt the "I" would be confused with "1"). The standard engine offered was the 413 cid wedge head V8 with "short" long rams which was now rated at 390 bhp. 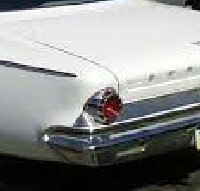 The “short” rams were divided internally only halfway which raised the torque peak from the 2800 rpm peak in the 1960-61 style fully divided long rams to 3600 rpm. This change provided spectacular high rpm performance in the 300 J. Also, the suspension was softened very slightly from 300 H specs, but was still substantially stiffer than other Chryslers. The 300 J was available in five colors: Formal Black, Alabaster, Madison Grey, Oyster White, and Claret. Two pinstripes (in a contrasting color) ran the length of the body and 300 J medallions were placed on the C-pillar and the rear deck. The interior featured a square steering wheel that many drivers found uncomfortable but allowed an unobstructed view of the instrument cluster. The seats were finished in luxurious claret red leather regardless of exterior color choice. The exterior even featured unique windshield wiper blades with airfoils designed to press the blade against the windshield at high speeds, important because the 300 J could reach 140 mph or more. 300J SERIES - (V-8) Available in two-door hardtop form only, the 300J continued Chrysler's image of providing the motoring public with a high-performance luxury automobile so synonymous with previous 300s. Leather interiors were standard and special 'J' medallions distinguished this car from the more common Sports Series 300s. Heavy-duty torsion bars, shocks and springs, plus Ram Induction manifolds were the main backbone of the 300 Js image. 300J SERIES I.D. NUMBERS: Serial Numbers were located as on previous series. Serial Numbers began with 8433-100001 and up. Engine prefix was C300J and then a month, day, year code (e.g. 11-10-62 - denoted November 10, 1962 build date). 300J SERIES ENGINE V-8. Overhead valves. Cast iron block. Displacement: 413.8 cubic inches. Bore and stroke: 4.188 x 3.75 inches. Compression ratio: 9.6:1. Brake horsepower: 390 at 4800 R.P.M. Five main bearings. Solid valve lifters. Carburetor: Two (2) Carter Type AFB four-barrels Model 3505S. CHASSIS FEATURES: Wheelbase: 122 inches. Overall length: (300 Sport Series) 215.3 inches; (300 J) 215.5 inches. Front tread: 61.3 inches. Rear tread: 59.7 inches. 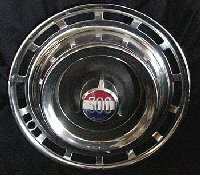 Tires: (300 Sport Series) 8.00 x 14; (300 J) 7.60 x 15. POWERTRAIN OPTIONS: Three-speed manual transmission with floor shift was standard on Sport 300. TorqueFlite automatic transmission on Sport 300 ($227). Automatic transmission was standard on 300 J. A heavy duty three-speed manual transmission was available on the 300 J at no extra cost. V-8 413 cubic inch 360 horsepower four-barrel engine “FirePower 360” ($162) on the Sport 300; N/A 300 J. Sure-grip differential ($52). Antifreeze ($6). CONVENIENCE OPTIONS: Power brakes on Sport 300 ($48); std. on 300 J. Power steering on Sport 300 ($108); std. on 300 J. Dual air conditioning with heater on Sport 300 hardtops ($612); N/A on convertibles; N/A on 300 J. Air conditioning with heater ($510). Air conditioner with heater w/ basic accessory group on Sport 300 ($409); N/A 300 J. Power antenna ($26). Auto Pilot on Sport 300 ($86); N/A on 300 J. Front console on Sport 300 ($165); std. on 300 J. Rear window defogger on Sport 300 ($21); N/A on 300 J. Custom Conditionaire heater ($102). Left outside remote control mirror ($18). Left power bucket seat on Sport 300 ($93); std. on 300 J. Right power bucket seat (w/ left power seat only) ($93). Power bench seat on Sport 300 4-dr ($108); N/A 300 J. Power door locks on Sport 300 4-dr ($56); N/A on Sport 300 2-dr; N/A 300 J. Power windows on Sport 300 ($108); std. on 300J. Golden Tone radio ($93). Golden Touch Tuner radio ($130). Golden Tone radio w/ rear speaker ($110). Golden Touch Tuner radio w/ rear speaker ($147). Rear seat speaker w/ basic accessory group on Sport 300 ($17); N/A 300 J. Pair of front seat belts in Sport 300 ($19); std. 300 J. Tinted windshield ($29). All tinted glass ($43). Leather trim on Sport 300 2-dr hardtop and convertible ($93); std. 300 J. Undercoating w/ underhood pad on Sport 300 ($18); std. 300 J. Leather bucket seats on Sport 300 four-door hardtop ($201). Vinyl bucket seats on Sport 300 four-door hardtop ($108). Front bumper guards on Sport 300 ($14); std. on 300 J. Rear bumper guards (w/ light pkg. only) on Sport 300 ($14); std. on 300 J. Front and rear bumper guards (w/ light pkg. only) on Sport 300 ($29); std. 300 J. Electric clock on Sport 300 ($19); std. 300 J. Safety padded instrument panel on Sport 300 ($14); std. 300 J. Inside tilt-type mirror on Sport 300 ($4); std. 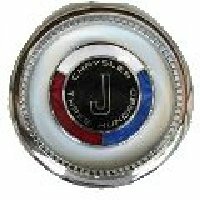 300 J. Deluxe steering wheel on Sport 300 ($16); std. on 300 J. Whitewall tires on Sport 300 ($42); std. 300 J. Windshield washer on Sport 300 ($14); Std. 300 J. Basic accessory group on Sport 300 incl. Golden Tone radio, heater, power steering, power brakes, windshield washer, light package ($395); N/A 300 J. Deluxe accessory group on Sport 300 incl. electric clock, O/S left remote control mirror, Deluxe steering wheel ($53); N/A 300 J. Accessory Package “A” incl. door edge protectors, rear license plate frame, vanity mirror ($11 on 2-dr models; $13 on 4-dr Sport 300). Light package incl. back-up lights, glove box light, luggage compartment light, map courtesy light, parking brake warning light on Sport 300 ($27); std. on 300 J. Here's another interesting limited production car commonly called the Pacesetter. It is also referred to as Pace Car. In 1963, Chrysler was again chosen to provide a pace car for the Indy 500, and instead of using the more appropriate 300J, they opted to send out a regular 300 convertible, probably so the crowd could see who the driver was. (Sam Hanks, Indy winner from 1957) Somebody with a chain saw was seen lurking near a 300J, but he was quickly apprehended and sent to work for GM. The 1861 pace cars were garden variety 300 convertibles equipped out of the box with a 305 horsepower 383 2 barrel engine, with either a 3 speed manual or the venerable Torqueflite. There were also 306 hardtops produced, but nobody seems to get too excited about them, just the ragtops. 1860 of the converts were Holiday Turquoise, (also referred to as Pace Car Blue) and one was black. All had white tops and interiors. They had a special Indy 500 emblem, and that was about it. The wheel covers look to be from the New Yorker, while the actual car used at Indy on race day had 15 inch wheels and 300J wheel covers. The usual list of options was available, including some very snappy 413 engines. For all genuine pace cars, the serial number on the VIN tag has to start with 80. The pace cars cost $4129.00, and weighed 3840 lbs. That's about $1.08 per pound, which was roughly what steak cost back in 1963.